In 2016 Angela Sanchez Del Campo graduated from the MA Curating and Collections course at Chelsea. She takes time out to tell us about her career over the last year, including working with the Collection Care and Conservation Team at Emery Walker’s House. Soon after I finished my MA, I joined the Collection Care and Conservation Team at Emery Walker’s House in January for about two months. The Emery Walker’s House, supported by the William Morris Society and Arts & Craft Hammersmith, is the nation’s most perfectly preserved Arts & Crafts house. I worked during the process of restoration, whilst the house was still closed to public. Here I had an excellent opportunity to work with their valuable collection and unpack, catalogue and update the collection items on the database as well as checking the condition of objects, cleaning and displaying them. After this, I started working at Central Saint Martins (CSM), one of the other colleges that is part UAL, at the short course department. Here I work in the office but I also have the opportunity to collaborate in many exciting projects that come up within the university. For example, I am now finishing curating a show at CSM featuring the work of some tutors who teach on the short courses. The exhibition, which aims to promote the courses and was organised by the marketing team, was a brilliant experience as I worked with diverse objects from different disciplines within the same space. I also participate in the cultural programme of East London Radio by interviewing gallery managers, art dealers or artists when some exhibitions and events come up in the area. Since I finished my MA, I also continued working on commissioned projects as I used to do before. 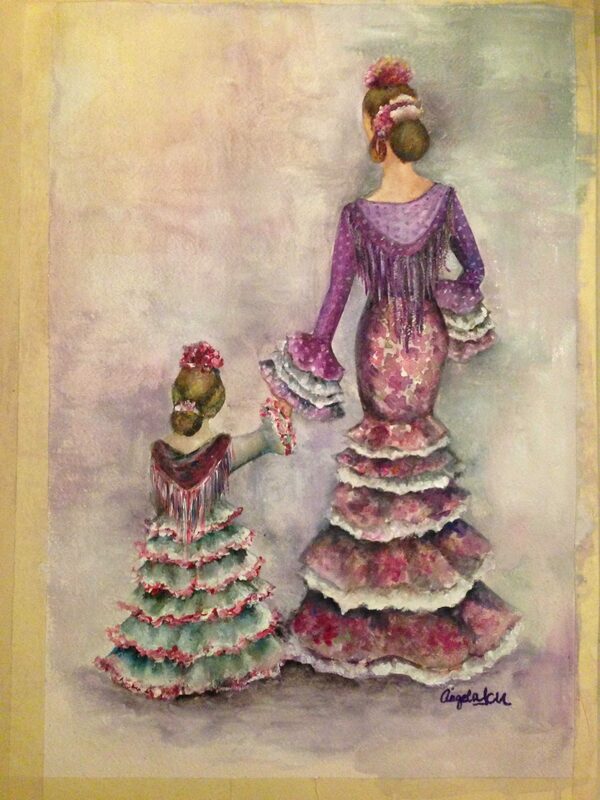 I am a fashion and costume designer as well as a painter specialising in watercolours and ink. Despite the fact that I am orientating my professional career towards curating, I will continue, where possible, to explore these areas as a personal development. I have been painting by commission and last September I organised and produced the decoration for a wedding, including the tailoring and transformation of the bride’s dress. 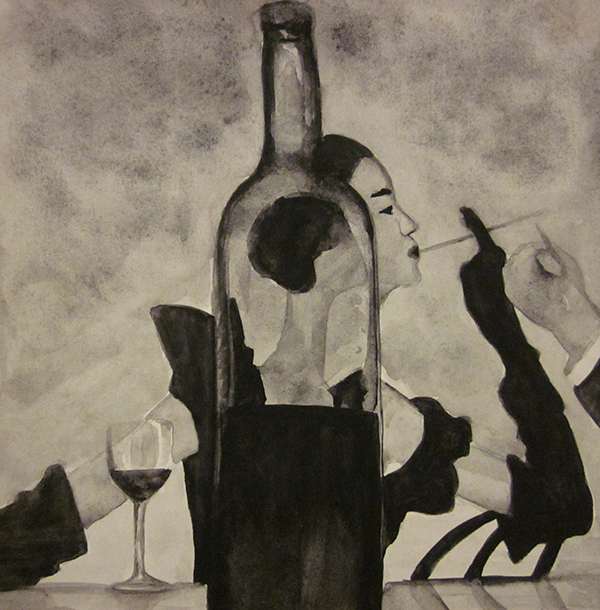 Black ink painting inspired by Irwin Penn photography. Image supplied by Angela Sanchez Del Campo. I studied two BAs in Spain. One was Fashion Design and Management and the other was History of Art. I cannot deny that my academic background and professional experience as a costume maker and designer have shaped my journey as a curator, during and after my MA. I tend to prefer theatrical exhibitions that offer an immersive experiences to the visitors. My curatorial approach shows a particular interest in exhibition design and using didactic techniques being applied to the museum. My professional interest is focused on design objects and collections. My research focused on historical dress and fashion in Europe alongside the display and presentation of these subjects in leading museums such as the V&A, and how the aesthetics of these exhibitions have evolved along with our current visual culture. I am organising an exhibition with the London Diocesan House and the Academic Dean at CSM in the church St.Martin-In-The-Fields. The exhibition aims to explore the historical connection between CSM and this church as the founder of Saint Martin’s School of Art before become Central Saint Martins. 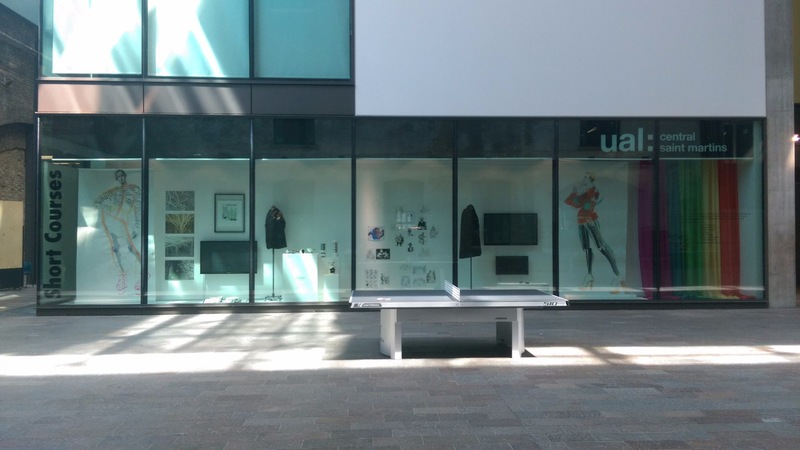 It will exhibit artworks and designs produced by students at Central Saint Martins. During my MA I had the opportunity to participate in a number of curatorial projects. This allowed me to identify my interests and the areas that I should focus on. Based on practical experience, I was able to see the paths I am better at, and the ones I enjoyed the most. I remember when I started my MA and I was scared of choosing one particular path because I thought it may limit my curatorial practice. Now I understand that choosing a path does not limit my practice but it defines it towards my own professional development. One cannot be an expert in everything without taking the risk of falling into mediocrity. I think one needs to specialise in an specific area in order to stand out. One of the greatest satisfactions I had during my MA was to take part in the Testing Ground Project at the Zabludowicz Collection in London. Here I had the opportunity to curate an exhibition in an important gallery from the extensive collection at Zabludowicz. I also worked with other MA students coming from other universities as well as the exhibition team at Zabludowicz, from who I gained significant knowledge. Despite the fact that the collection focuses on Contemporary Art, which is not my area of research, my curatorial development and professional experience there was invaluable. I plan to stay in London for now. This city is a melting pot where opportunities arise every now and then. I am incredibly happy in my current position at CSM. I aim to stay there and participate in as much projects as I can. It is wonderful to be surrounded by staff and students alike, and see the amazing work that is produced by the students. I consider it a great source of inspiration and I am proud of being part of it. At the moment, I am planning to teach the subjects of History of Aesthetics in Art and Curation. As an Art Historian and Curator, I think these subjects are crucial in order to understand what happened before and why aesthetics ended up as they are today in art. In the long run, I may do a Phd in historical dress and fashion exhibitions. The way in which fashion is approach in the museum, and how it is exhibited, is certainly one of my passions. In this context, the work of Amy de la Haye and Judith Clark, both academic staff at the London College of Fashion, was exceptional for my research and a great inspiration for further areas of development in my future academic journey. Flamencas. Watercolours and acrylics on paper. Image supplied by Angela Sanchez Del Campo. As part of my independent curatorial endevours, I am developing a proposal of a permanent exhibition of the history and evolution of the flamenco dress to be exhibited in Spain. This is still in the first stage and the idea is just pencilled in, but my plan is make an exhibition which shows and explains the history and legacy of this regional dress in order to preserve and transmit it for future generations. I miss being involved in curatorial projects all the time. I remember it was a never-ending cicle of one exhibition after another, and that was excellent to learn the skills and gain experience to become a curator. In this context, I truly miss the sessions with Donald Smith, the Director of Chelsea Space, who was our tutor in the practical sessions at installing exhibitions. I always appreciated not only his significant experience but also his honesty and clarity when something needed to be changed or rectified. He would always find a good example to prove his point and he would tell us a relevant story that he witnessed which would prove why something needed to be different in the exhibition. Exhibition Jocelyn Herbert & Tony Harrison, 2016. Discussing how to display the exhibits with Donald Smith, director of Chelsea space. Photo credit Sophie Den Toom. The exhibition that I enjoyed the most during my studies at Chelsea was the exhibition we curated at the Chelsea Cookhouse with the objects from the National Theatre Archive featuring the work of Jocelyn Herbert and Tony Harrison. As a costume designer with experience in theatre, I was really pleased to work with the talented set and costume designer Jocelyn Herbert. I enjoyed every single part of this project, from the research in the archive, to the research in the costume hire and the installation of the exhibits. The importance of researching a subject with academic rigour and the advantages of cross referencing, cross checking and contrasting everything you read relating to your research. In other words, questionning everything that you read and question the authors that you read. Anyone can write, but it is important to what extend you can believe what is written, depending on who the information comes from. The help and support of the director of the MA in this subject, David Dibosa, was crucial. He was a key element in my academic development in regards to my area of research, and his guidance was excellent. I only regret the course did not have more formal sessions with him. I just graduated so I think I am not in the right position to advise someone else in a similar situation. 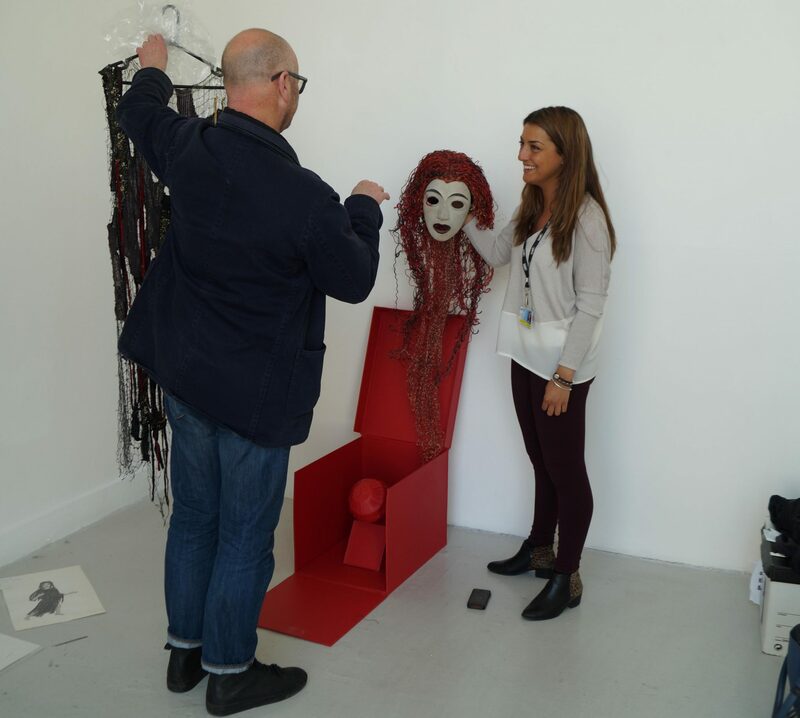 I could, however, advise students who wish to go further in their career and study a MA in Curating. I think it is essential to have very clear what their area of research is and then look into the tutors who would guide you during the course. Not the director or the complimentary academic support, but the tutor(s) who you will be in class with most of the time during the academic year and who will advise you on a daily basis. I consider essential that this person has experience or some knowledge in your particular area of research. I didn’t even think about this when I was due to choose my MA, but now I understand its importance. One believes that the tutors will be experts, and they surely are, but in their subject, not in everything. As anything can be curated, and the subjects of research in this regards can spam from a wide range of fields, the curatorial approach and the rationale behind the projects cannot be the same for all. Therefore, my opinion is that, if you wish to specialise and research in a subject, and the tutor is specialised in other subjects completely different, it is very likely that the guidance received in your specific area will be vague or ambiguous, or both, which could easily have an unfair impact in the student’s general performance. Also, I would like to recall the importance of developing your network before, during and after you are studying. It doesn’t matter which gallery it is or what the show is about, just go to the opening, chat and socialise. You will get to know new people and you never know who is listening. Also, people tend to be more communicative with a glass of wine in their hands and you may even be invited to help in a new project. Just say yes, it does not matter that you will end up working for free in a few projects, you will have in exchange the opportunity to include this experience in you CV and to meet people from your sector.